Update 23.5.2014: The report has now been released and is available here. The headline number is a resource of 4.4 billion barrels of oil in place. The big news today is that the BGS report into the hydrocarbon potential of shale rocks in the Weald Basin will be released. The Weald Basin stretches across the south of England, through the home counties from Dorset to Kent. 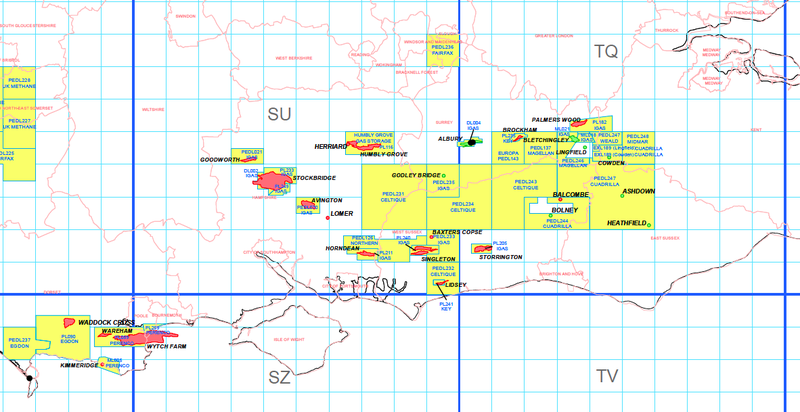 It already hosts one very large oilfield at Wytch Farm (the EU's largest onshore oil field) and a number of smaller onshore oil and gas fields. The general public is largely unaware of these fields - I can speak from experience because I grew up almost directly above one of them - Humbly Grove in north Hampshire. I had little idea it was there until I went off to university to study geology. The report is scheduled to be released later today. I suspect I will be on the plane by the time it is released, but rumours are already circulating in the media. See here and here for examples. Two things to note: firstly, all the talk is of shale oil, rather than shale gas. Secondly, the numbers being bandied about are, much like the BGS numbers for gas in the Bowland shale, very large. Again, the big question will be how much of this resource can be extracted. In terms of production methods, the difference between oil and gas isn't particularly significant. Hydraulic fracturing is still used to create fractures in the shale rock, allowing the hydrocarbons to flow. The only difference is that it is a different hydrocarbon doing the flowing. However, of particular significance is in the value of the two products. 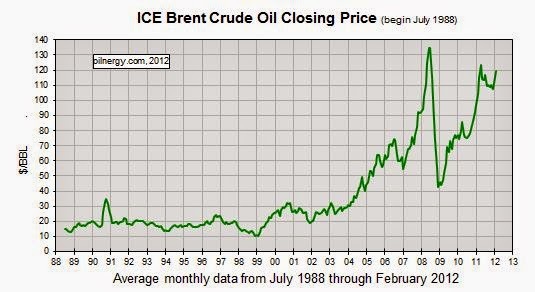 Over the last 15 years, the price of oil has risen substantially. If the BGS numbers are accurate, and the oil can be extracted, then this may have a significant economic impact in terms of taxable revenue for the government, and also for the UK's balance of trade. We've seen the economic significance of oil in the war of words over North Sea oil that has accompanied Scotland's independence debate. It may also have an impact on the way shale is being discussed in the UK. I have argued that gas is a necessary component of our energy system. However, opponents of shale gas argue that we should place more emphasis on renewables. I agree that we should place emphasis on renewables as well, but do not think we can do without some form of fossil-based electricity generation for a long time to come, and I would rather it be gas than coal. Nevertheless, a significant portion of shale gas opposition appears to stem from the desire to de-carbonise the electricity generation sector. The fact that it is oil underneath the Weald creates a different argument. Oil is no longer used in the electricity generation sector. Oil has two main uses: as liquid transport fuels (petrol, diesel and aviation fuel), and in the manufacture of plastics and synthetic materials. It is difficult to see how an increase in domestic oil supply for these uses will have an impact on the deployment of renewable electricity generation technologies, which is the greatest fear of environmental campaigners who oppose shale gas. As the current fear is about fracking, it would be useful to know where in the country this technique is currently being deployed, and for how long. Many people assume that it is new and this is what is making people fearful. I have not heard of any issues with any oil or gas wells here in the UK, so if we have already got examples of successfully fracked wells then this needs to be made public. It has been made public, but the antis do not want to know. There have been 2.5 million frack jobs around the world, and I believe 200 in the UK in Beckingham Marshes. http://www.bbc.co.uk/news/uk-england-23756320 The antis have been making big deals about the 'High volume' aspect of shale fracking, and how it is a 'new' technology. Will they still protest about a standard enhanced recovery technique in Surrey that produces the fuel for their BMWs? Derek, there is differnce between fracking a standard well with acceptable but slowing flow rates to having to frack shale oil / gas. Because of the tight rock formation it requires the newer multi well pads drilling horizontally simply to have any form of flow. This nature of getting the stuff out the ground is why fracked shale wells usually decline by 90% within the first year. Hence the need to re drill pockmark the landscape with wells and increase the use of both drililing fluids and water used to simply maintain any production. Most Shale operation in the US are seen as little more than Ponzi schemes financed by the Feds money printing. KW is being silly pretending that theer is no difference bewteen fracking a conventional well and large scale HVSW fracking. There is only 1 well that has been officially fracked in this manner according to the DECC in the Fylde peninsular - the one that Cuadrilla Resouces broke the well head, failed to inform the authorities and have taken no real remidial action since. So not a good record for either the cowboys operations trying the initial drillings nor for the alleged "Gold Plated" regulation disingenuously pretended by the Government.